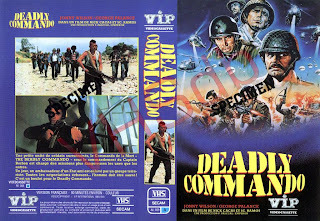 Virtually indistinguishable from the hundreds of soldiers-vs-rebels propaganda reels coming out of Marcos-era Philippines, the seemingly blessed Deadly Commando (aka Suicide Force; dirs. 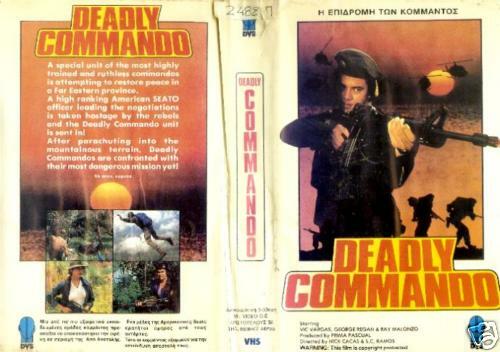 Nick C. Casas & Segundo Ramos, 1981) enjoyed a remarkable international run for a Pinoy goon actioner, being less than a handful of local titles sold at the 1982 Manila International Film Festival and sold for export by German company Atlas International. 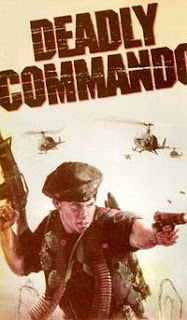 A visiting “American” General is kidnapped by Muslim separatists, and the Commander-In-Chief (Johnny Wilson) sends in Captain Borbon (Vic Vargas) and his crack unit of black-clad commandos known as the Savage Six (George Estregan, Rey Malonzo, Ace Vergel, Rex Lapid and Efren Reyes Jr), recently freed from a military prison, to bring him back alive. The group are aided by former rebel Adora (Elizabeth Oropesa) who gladly trades her freedom fighters for the prospect of peace; not so her brother Cris, the General’s kidnapper also known as The Professor (Rodolfo “Boy” Garcia), an uncompromising idealist intent on a bloody and protracted war with the Philippines government. 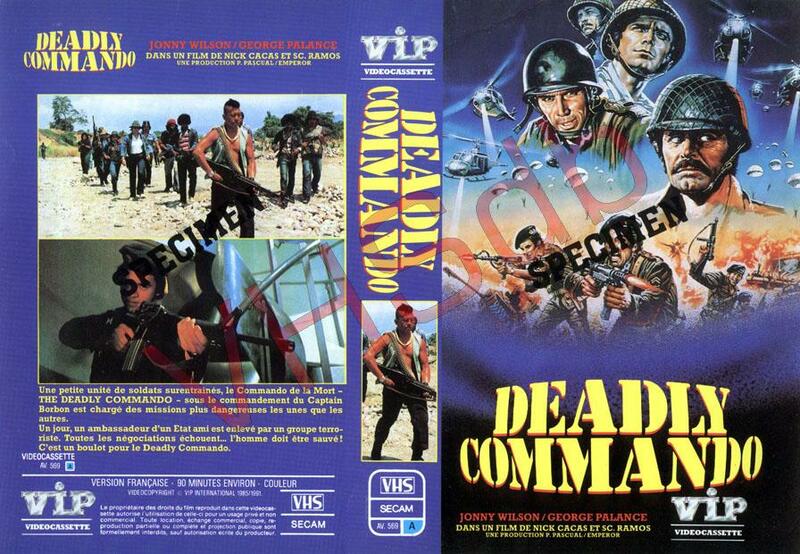 With this and Emperor Films’ follow-up Death Raiders (also dir. Segundo Ramos, 1983) there’s plenty of action of the bland “shoot, fall down” variety, although kung fu specialist Malonzo gets to trade chops during a bar brawl, while Estregan, true to form, has his tongue down the throats of not one but two bar girls! 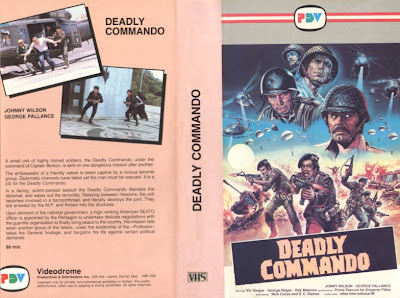 With an uncredited Phillip Gamboa as the General’s driver, and a very early bit role for doomed bold superstar Claudia (Shame) Zobel. 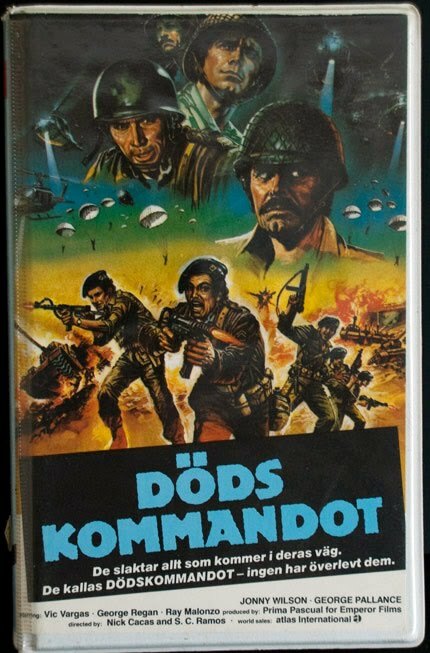 A crack unit of Amy soldiers (known as The Savage Six) are sent to rescue a kidnapped ambassador in this surprisingly expansive Filipino war action film, filled with stunts, gun battles and explosions. They successfully rescue the ambassador and celebrate at a bar, where they get into a (prerequisite) fight with a group of drunk patrons (one of the soldiers beats up half the bar using nothing but a food plate!) which ends with them being sent to the stockade. 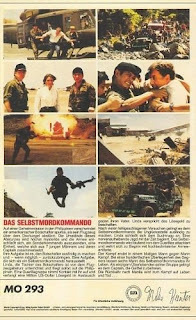 When an Army general agrees to a peace talk with some opposition guerillas, he's kidnapped by a group led by someone called the Professor (Boy Garcia). 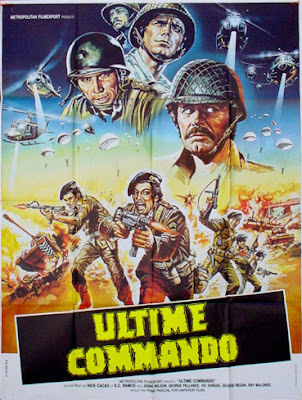 The crack unit is sent in to rescue the general in a commando raid, but first they must be freed from the stockade. The Professor's sister, Adora (Elisabeth Rope), agrees to work with The Savage Six from the inside (she's a guerilla, too, but it doesn't agree with her brothers politics), while the commandos parachute out of a helicopter and land behind enemy lines. The Professor is well aware of their presence and puts his camp on alert. When the Professor refuses to listen to his sister's plea for peace, Adora and her group join forces with The Savage Six, but when they raid the Professor's camp, it is deserted. The Professor then puts out word that his sister is a traitor and calls for all the guerillas in the area to kill her and her group as well as the Savage Six. Almost immediately, they are ambushed by the enemy and must fight their way out of a sticky situation (and amazingly, walk away without a single casualty). The Savage Six rescue the general in a cave, but become trapped there when the Professor and his guerillas surround them. The finale finds the Savage Six and Adora fighting impossible odds to bring the general back to safety. After the Professor is killed by a mortar round (he blows up real good) and our heroes make it to safety (with only one casualty! ), an off-screen voice tells us that the general's mission was a success and both sides signed a peace treaty. 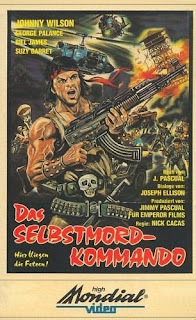 This early 80's Filipino action film, directed by Nick Cacas, (FORGOTTEN WARRIOR - 1986) and Segundo Ramos (DEATH RAIDERS - 1984), is more political than most Philippines-made actioners (script by Donald Arthur). 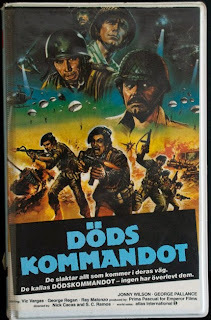 This may be because some real-life Army generals and personnel portray themselves here, as the Americans are portrayed as understanding, willing-to-make-a-deal patriots, while the guerillas (one of them sports a mohawk!) are depicted as trigger-happy thugs (when one of the Professor's men suggests to him in the finale that they should surrender, he shoots him!). While the violence isn't all that bloody (just plenty of bullet hits, a couple of head shots and some stabbings), the action comes fast and furious. Particularly striking is the final scene of the film, a long shot in slow-motion of our heroes escorting the general down a hill while it is repeatedly bombarded by shellfire. It is a striking scene, almost poetic in it's execution. The opening raid on the bad guy's house to free the ambassador is also a triumph of execution, as the mansion the bad guy lives in is quite a set piece and is not the usual choice for explosions and carnage. While the middle portion of the film drags a little (politics, passion and pathos comes into play at this time), it's still fun watching a cast of Filipino pros, including Johnny Wilson, George Pallance and George Estregan (billed here as "George Regan") playing members of the Savage Six. Estregan, in particular, is a hoot, as he plays a ladies man who finds time to makeout with a female guerilla in the middle of a firefight! All three would basically reprise the same roles in Ramos' DEATH RAIDERS. Also starring Ray (Rey) Malonzo, Vic Vargas, Archer Vergel, Jimmy Santos, Red Lapid, Efraim Reyes Jr. and "Joel Sandoval's Group" of stuntmen. 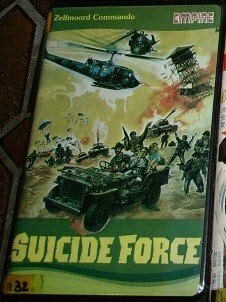 Originally known as SUICIDE FORCE, which is somewhat of a misnomer since only one member of the Savage Six actually dies.